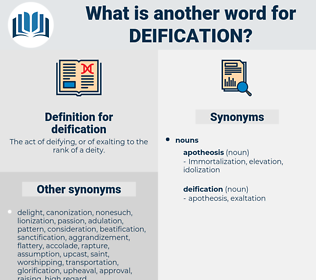 What is another word for deification? The act of deifying, or of exalting to the rank of a deity. decrease, disdain, depression, unimportance, Spurning, demotion, lowness. debasement, disobedience, stigma, ignorance, disgrace, reproach, disbelief, disrespect, condemnation, blame, criticism, neglect, blemish, disclaimer, scorn, heedlessness, censure, disregard, dishonor, derision, humiliation, doubt, degradation, Lowliness, ill repute, denunciation, distrust. hatred, dismissal, loathing, disfavor, disapproval, dislike. 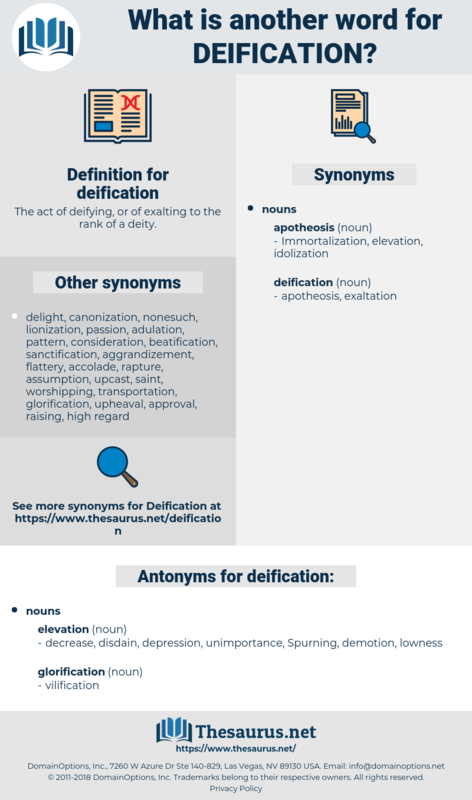 defection, deposition, depiction, divagation, devastation.